We are indebted to the following more than 70 musicians and friends of BO DIDDLEY for their contributions to these 3 special 70th birthday tribute pages. Read LADY BO's birthday message to BO DIDDLEY here. "Thank you for the E about one of my favorite people....BO DIDDLEY! Add my BEST BIRTHDAY WISHES to that legendary guitar man. I first heard "Bo Diddley" and "Hey, Bo Diddley" on the Porgy Chadwick radio show on WAMO in Pittsburgh in the 1950s. I first met Bo Diddley when he played the first Rock & Roll Revival tour in the Northeast in late December 1969. First impression was that he was imposing, mean and nasty. Nothing could be further from the truth. We became friends and expressed a great respect for each other's contribution to Rock & Roll and for the artists who share their hearts with us. In the mid-eighties I put Bo on a multi-city tour in the UK with Rick Nelson, Del Shannon, Bobby Vee and Frankie Ford. Bo's performances were so awesome that Rick Nelson's manager demanded an intermission immediately aftr Bo's set....There was no way that Rick could follow him...no way! Bo, if you read this little piece of music history, just know that I love you....always will", Richard Nader, Richard Nader Presents Inc.
BO DIDDLEY shared his birthday with the following musicians: Paul Stookey (1937), Michael Nesmith (1942), Davy Jones (1945), Patti Smith (1946), Jeff Lynne (1947) and Suzy Bogguss (1956). "Bo Diddley, may you continue to inspire, influence and teach future generations of musicians who fall under the spell of the Bo Diddley Beat. May you continue to entertain audiences with your unique talent, professionalism and charm, and may you continue to fully enjoy all the recognition that you so richly deserve. 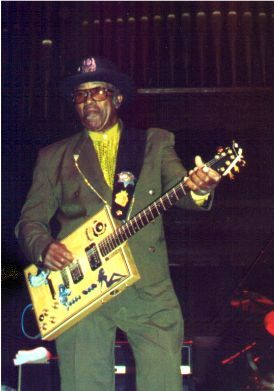 Bo Diddley, for 50 years the Light-Heavyweight Champion of The Rhythm and Blues World....We Salute You!"